G&G Signs has spent many years working closely with leading Traffic Management, Construction & Civil Engineering companies in order to fully understand the needs of the industry. 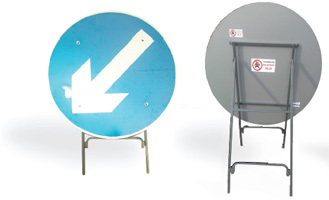 Zintec is a cheaper alternative to aluminium and widely used for temporary signs & frames, manufactured on 22g Zintec. 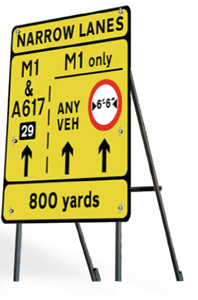 All signs come with the choice of either the standard Class Ref I reflective, Class Ref II reflective or Gloss Vinyl. Designed according to Transport Design Regulations, our Zintec road plates are extremely durable and can be ordered separate, clipped or riveted into hard wearing steel frames. DIBOND is a relatively lightweight yet very rigid aluminium composite material, consisting of a polyethylene core and aluminium cover sheets with a thickness of 0.3 mm. Front and reverse sides are coil-coated according to ECCA-Standards. The special aluminium alloy offers increased corrosion resistance. Despite its light weight, DIBOND offers high rigidity and perfect flatness. Excellent exterior stability within a range of temperatures from - 50 to +80°C and minor thermal expansion DIBOND is environmentally friendly and fully recyclable. DIBOND HAS NO SCRAP VALUE. G&G Signs’ new Union Pedestrian Barrier is a 2M x 1M one piece injection moulded barrier ideal for crowd control purposes. Lightweight for easy handling yet extremely robust, the Union Barrier offers a perfect alternative to our traditional ‘Watchman’ Barrier system. With thermoplastic feet and manufactured from 100% recycled materials, the Union Barrier rotates 360 degrees to facilitate easy stacking, storage and transportation.